It didn’t take long for Julie Liu — late 20s, smartphone-addicted, constant Googler — to get hooked on the online review site Yelp. Where to eat Friday night? Read some reviews by random anonymous diners. Oh, that looks good. Book a table online, show up, eat. But after Liu and her sister opened Scion restaurant in Dupont Circle, they saw Yelp from a different angle. Liu said Yelp’s salespeople phoned repeatedly, telling her that if she advertised on the site, negative reviews would move lower on Scion’s page and positive reviews would move up. Liu decided to fight back, joining nine other businesses this month in a class-action lawsuit against Yelp alleging similar tactics — claims that Yelp executives deny. “Yelp does not manipulate content on behalf of advertisers or penalise those who don’t advertise,” a spokesman said. Now, let’s try to square that with what Yelp CEO Jeremy Stoppelman is saying. And now let’s take a look at Yelp. 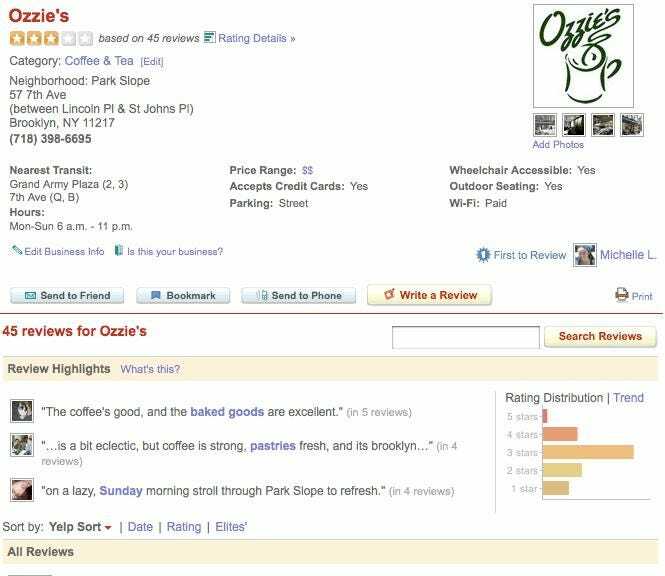 Below is a section of a page for a coffee shop in New York. 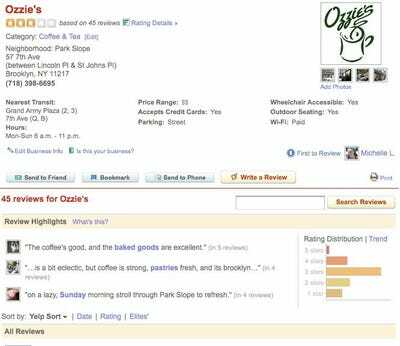 The page contains sections called “Review Highlights” and “All Reviews.” The coffee shop does NOT appear to be a Yelp advertiser. So this is what a Yelp company page looks like when a company is not an advertiser. And now let’s look at the page of a company that IS a Yelp advertiser. The advertiser’s “favourite” review is at the top. It is a very long, articulate, edited, and highly detailed five-star review–the sort of review that a PR firm would produce. The review completely dominates the advertiser’s page, shoving all other reviews so far below the fold that a reader has to scroll way down to find them. (That’s only about half the review, by the way. As you can see here, it goes on and on. We can conclude that all parties are technically correct. 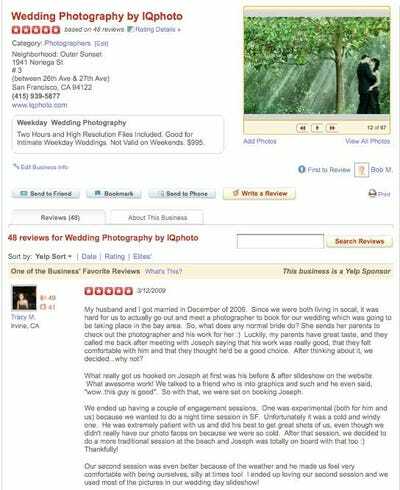 The Yelp salespeople who told the small-business owner that, by becoming an advertiser, she would be able to cause positive reviews to move up the page and negative reviews to move down the page were right. The potential Yelp advertiser was probably also justified in feeling bullied by this: If Yelp’s salespeople are selling Yelp ads by repeatedly pointing this feature out, it’s no wonder that some potential customers feel like they’re being extorted. Meanwhile, CEO Jeremy Stoppelman was right that what the advertiser gets to do is to highlight one review as a “favourite.” But as the example above shows, this is a much more powerful benefit than he makes it sound like it is. But it’s more than just advertising. It’s potentially powerful and misleading advertising, because it carries the appearance of being an objective review. Which, in some cases, it almost certainly isn’t.